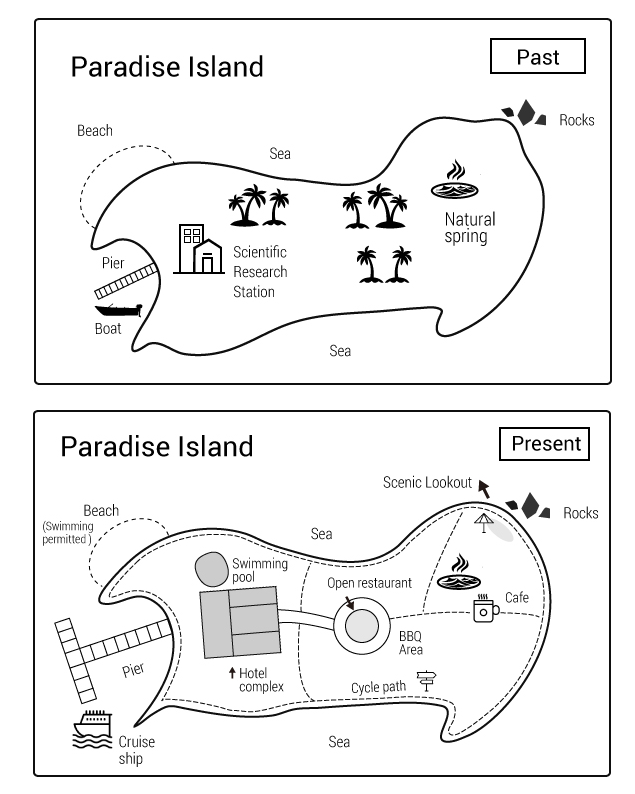 The maps illustrate how Paradise Island has changed over time from a science outpost to a thriving resort. Overall, the island’s coastal features, which were largely untouched in the past, have been developed for tourism with significant infrastructure and building development in land. In the past, the island was almost completely undeveloped except for a small pier and scientific research station on the east coast. A few trees occupied the island’s interior, with a small beach and rocks in the north and a natural spring in the west. Today the island has changed considerably. In land, the small scientific research outpost has been replaced with a large hotel complex and swimming pool. The small pier has been extended to accommodate large cruise ships, and minor road built up to the hotel. To the west of the complex, an open restaurant has been established with a BBQ area at its center. From there various paths connect to the rest of the island’s features. Along the coast, circumnavigating the island, a bike path connects several new tourist features including a scenic lookout next to the rocks, and swimming area at the beach. A café has also been constructed alongside the natural spring. The introduction states overall changes from past to present. Later paragraphs should state where the changes are and how they are ordered by relative location to each other. Consider what relates all the major changes on the island. In this case, it’s tourism. Use locational phrases and prepositions to order your writing. This map shows a state of little development to one of full development. How you describe this paragraph will decide how you order the next. Flow is important. Give an overall topic sentence stating what the key changes are, then exemplify them with supporting sentences. If changes cannot be describe in terms of north, south, east, west, try inland and along the coast. Present perfect is used to describe the changes as occurring at some point in the past before now. Don’t use past simple. Describe later state of islandIt would have been fine to include the coastal change within the second body paragraph. However, separating it makes the writing easier to follow.“Circumnavigates” means to go around something. Overall, the island’s coastal features which were largely untouched in the past. It has developed for tourism with significant infrastructure and building development in land. In the past the island was almost completely undeveloped except for a small pier and scientific research station on east coast. A few trees occupied island’s interior with a small beach and rocks in north and natural spring in west. Today the island has changed considerably. In land, small scientific research outpost has been replaced with a large hotel complex and swimming pool. The small pier is extended to accommodate large cruise ships, and minor road built up to hotel. To the west of the complex, open restaurant has been established with a BBQ area at it’s center. From there various path connect to the rest of the island’s features. Along the coast, circumnavigating the island, a bike path connect several new tourist features including scenic lookout next to the rocks, and swimming area at beach. A café have also been constructed alongside natural spring. The relative clause using “which” just needs to be inserted into the overall sentence using commas. “the” is used with NSEW directions. Describe what you consider to be the major changes over time.